Ah, ’tis the season to be jolly, but that smile may turn upside down if, on Christmas morning, everything’s gone – – – including the tree. Home security is often overlooked as we become overpowered by the holiday spirit. In fact, this is the time of year when we see the most burglaries per day. Professionally-installed home security systems can be expensive ($25 to $56 per month plus installation), but there is a way to feel secure and keep an eye on your goodies. We’ve been playing with a new 360-degree indoor camera from Guardzilla ($199.99) that lets you see a whole room using your mobile device. Also, built-in motion detection enables a 100 decibel siren if there’s activity within its view. Of course, you need to remember to deactivate this feature when you’re in the area. It was very easy to set it up. 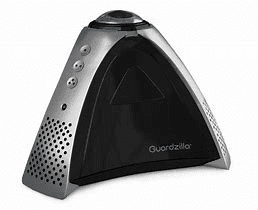 All we had to do was, plug it in, give it access to our Wi-Fi network and download the Guardzilla app to our phone. Once that was done, we could use the app to monitor the area covered by the camera, swiping left and right to see everything. We were also able to scare the family pet by using the camera’s two-way talk feature. Auto Alarm, which lets you control the motion detection including the ability to set up a schedule to automatically enable and disable the alarm. 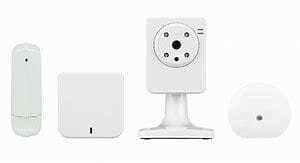 The Home8 ActionView Security Video-Verified Interactive Valuable Protection System ($99.99) is an expandable system that starts you off with a camera, security gateway, a valuables tracking sensor and a radio-frequency dongle. It takes a bit longer to set this system up because of all the extensions but, once it’s enabled, you have everything covered – – – from motion-detection to tracking missing items. Plus you have the option of adding window and door sensors, more cameras, a smoke alarm and more tracking devices giving you a complete home security system. Off-site monitoring is also available ranging from a free basic plan to a Premium Plan ($9.99 per month). You can also store videos and audio on a 32 gigabyte SD card that slips into a slot on the camera. The camera has a 66-degree viewing area, so it should be installed in a spot from which it can see all of the room being monitored. It also features motion detection that will send alerts to your phone, night vision and a microphone. The tracking sensor will notify you if the item it’s attached to is moved. The security gateway is used to connect everything into one nice, tidy package and the RF dongle communicates with all battery-powered devices like activity tracking sensors, fall detectors, and panic buttons. Last, but not least, is a secure door lock. August and Yale have teamed up to create the Yale Assure Lock Touchscreen ($279) that can be controlled by setting up an access code on the lock or remotely using a Connected by August app on your mobile device. You can also ask August to unlock the door using an Amazon Kindle, Google Assistant or Siri. The lock features a keypad that enables you to enter a four-digit code to unlock your door (which means you can leave you keys at home). Or you can use the August mobile app to remotely unlock the door. The lock attaches to any existing deadbolt, with the keypad sitting on the front of the door. It then uses August technology to communicate via a Wi-Fi bridge that you can plug into any electrical socket.